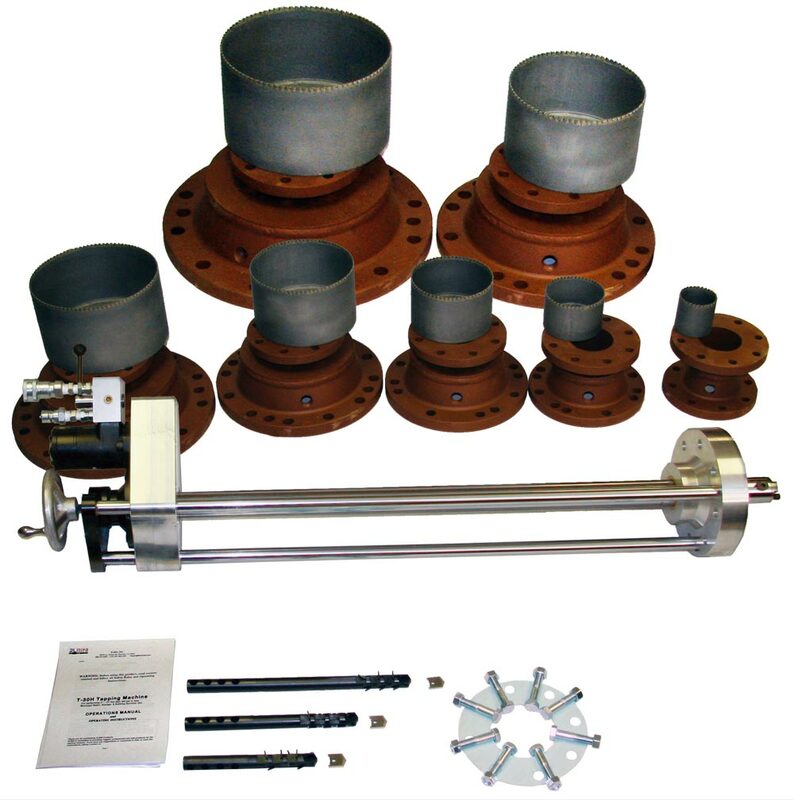 T1-2 Machine Turn-Key Package Taps 3/4"-2"
T1-4 Machine Turn-Key Package Taps 3/4"-4"
T1-A Machine Turn-Key Package Taps 3/4"-4"
T1-M Machine Turn-Key Package Taps 3/4"-2"
T1-8 Machine Turn-Key Package Taps 4-8"
T-24e Machine Turn-Key Package Taps 3-8"
T-30E Machine Turn Key Package Taps 3"-12"
T-30h Machine Turn-Key Package Taps 3-12"
T-30a Machine Turn-Key Package Taps 3-12"
T-37h Machine Turn-Key Package Taps 3-16"
T-37a Machine Turn-Key Package Taps 3-12"
T-46h Machine Turn-Key Package Taps 12-24"
T-60h Machine Turn-Key Package Taps 12-36"
T-112h Machine Turn-Key Package Taps 24-60"
HP-104 High Pressure Machine Turn-Key Package Taps 1/2-4"
HP-106 High Pressure Machine Turn-Key Package Taps 1/2-6"
T-37 Hydraulic Tapping machine has 37" of travel with a powerful hydraulic motor and disconnects that taps 3" - 16" on all types of pipe quickly and safely. Operating max. pressure: 300 PSI. @ 100 F. Operating Temperature: 250 F. @ 250 PSI. 3" - 16" pressure tap-ins for chilled carbon. Requires approx. 8 G.P.M. @ 1700 P.S.I. For more accessories please scroll down the page. 300 PSI. @ 100 F.
250 F. @ 250 PSI. Includes operating handle, adaptor bolts, pilot pin & screws. *Need additional items to complete your hottap? Items such as pilot drill bits, class 150 lb., 300 lb., and 600lb. ANSI Flanged and Threaded Adaptors? Feel free to call us at 1-800-279-5659 to complete your order or any other support you require. Our experience in the service industry dates back 37+ years. It is a tough, active, and intense industry that is unforgiving of mistakes and malfunctions. Choosing your tools wisely is imperative in this industry, which is why we started developing simple, dependable machinery for critical projects in the pipeline industry. Pushing beyond what is expected is what this website was founded on. Copyright © 2019 Tapping Machines. All Rights Reserved.